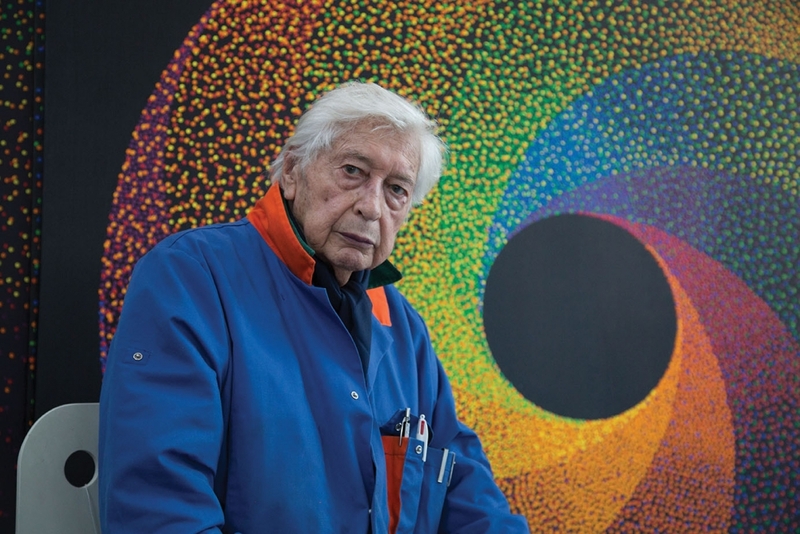 Born the second son of a low-class family –his father was a railway worker; Julio Le Parc was born on September 23rd 1928 in the town of Mendoza, Mendoza state, located at the foot of the Andean Cordillera, 1100 kilometres west of Buenos Aires, Argentina’s capital city. He spent his childhood in Mendoza and started school there. Overall a mediocre student, he was however gifted at sketching celebrities portraits and illustrated cards. He started to work on and off from age 13, as a delivery boy, as an apprentice in a bike’s repairs shop, even as a fruit packer in a factory. In 1942, he settles down in Buenos Aires along with his mother and brothers. He was working in the day as an apprentice at a fine leather goods manufactory and studying at night to prepare the School of Fine Arts, admission exam/test. After studying four and a half years plus two and a half years yet again to get his degree, he leaves the Fine Arts Academy in a total and confused rebellion against submission and obedience. He becomes somewhat marginal, meets with anarchists and Marxists, and tries to comprehend his problems in a different way. He wanders around the country, getting some odd job as construction or steelworker. Aware of being an outsider, he returns to society, works as a concierge at an official theatre, joins an independent experimental theatre company, and takes as a free candidate the admission test to the Fine Arts Superior School, which he gets the second time around. A founding member of Groupe de Recherche d’Art Visuel (GRAV) and award-winning artworks, he is a significant figure in Argentinean modern art. Le Parc, Laboratorio de Arte Alameda, Mexico City, Mexico. Luz Espacio Movimiento. Obras de Julio Le Parc, Palacio de Bellas Artes, Mexico City, Mexico / Museo de Arte Moderno, Rio de Janeiro, Brazil. Flash! Light and Movement. Tampere, Finland. 50 años de pintura geométrica latino-americana. La Plata, Argentina. I Bienal de Cuenca. Cuenca, Ecuador. Arte Programmata e Cinetica 1953-1963. Milano, Italy. Brigade International de Peintres Antifascistes. Athens, Greece. Groupe de Recherche d'Art Visuel. Paris, France. IV Bienal de São Paulo. São Paulo, Brazil.